The Goodies were a mad cap comic team that rained supreme with there unique and often loose canon humour in the 1970’s. The Goodies were Tim Brooke-Taylor, Graeme Garden, and Bill Oddie. The Goodies were a kind of insane Trio based in Cricklewood and were up for any challenge each week. In effect they were a cross between Monty Python and the Three Stooges. 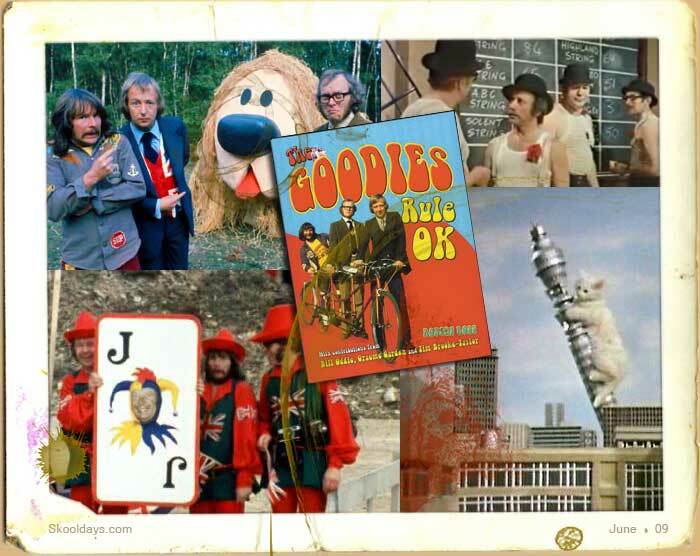 As kids though, The goodies humour was so far fetched it made great fodder for the conversations and stupid pranks the following day at school. No one can forget the incredible Kitty Kong or the amazing Beanstalk episodes. Their is a club called The Goodies Rule – OK! This Fan Club is an internet based club for fans of The Goodies (Tim Brooke-Taylor, Graeme Garden, and Bill Oddie). The club started in 1995. There are around 5 thousand members in more than 70 countries! I can remember the “string vest episode” where it was cool to wear string, string vest string pants, every thing was string. To add to its craziness you had well know celebrities pushing the boundaries by appearing on there and supporting the craziness. Poor old Nicholas Parsons got ribbed many a time for his ugly mug. It was crazy , bizarre, but very good fun and as kids it really was a gem that should be repeated one day.